During the 1930s Depression, my grandparents, Jacob and Lena Willems, leased three different farms from the California Land Bank. The first was near the town of Reedley; the second was just a half-mile east of Dinuba; the third was near the tiny town of Orosi a few miles east of the farm in Dinuba. 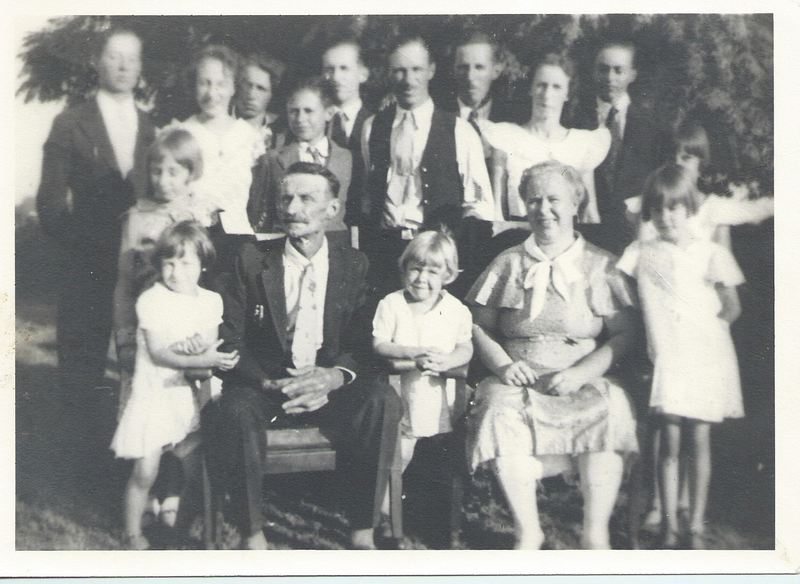 The family story divides into multiple strands in the 1930s. The older boys were now in their twenties. They’ve begun to leave home, follow out their own story lines. However, the place where their parents and younger siblings live is still ‘home’, a place to which the older boys periodically return. Sometimes it was homesickness that brought them back; sometimes it was because they’d run out of money and could not find work; sometimes it was because of a major event in the life of the family. One of those important life events was the death of Heinrich H. Zimmerman, my grandmother’s father, a gentle man who was deeply loved by his children and grandchildren. Heinrich died on September 12, 1934. The photo below may have been taken when the family gathered for the funeral. This is the only family photo I have in which all seven of my grandparents’ sons are present. Exactly six months after the death of his grandfather Heinrich Zimmerman, on March 12, 1935, Henry, the third oldest boy in the photo above, would die from kidney failure. The family again gathered for a funeral. No family photo was taken this time. It is one thing to lose a father and grandfather, a man who has lived a full life. It is another to lose a son and brother only twenty-three years old, a young man who leaves a wife and tiny daughter. That is a terrific picture which I have not seen before. Isn’t it great. It captures that time in the family’s life so well.